I’ve hired thousands of translators and interpreters for over 20 years, many from ATA conferences. Here’s how to attract attention, stand out from the crowd and win new clients. You’ve arrived in sunny San Diego to 70-degree, zero-humidity weather and spectacular views from your room of sailboats, cruise ships and bright lights on the bay. The conference launches tonight with a Welcome Reception that is always packed and energetic. It’s the first of many opportunities you will have over the next four days to market yourself and your skills to potential new clients. A central tenet of successful marketing is to put yourself in your customer’s shoes. Think like a translation buyer, not a translation provider. ATA conferences are distinctly different experiences for translation buyers. They are bombarded and often overwhelmed by the hurricane forces of resumes, business cards and pitches and blasted by a dizzying array of faces, names, languages, events and sessions. So everything becomes a blur. When I used to work my company booth in the Exhibits Area, it took about two days before my brain staged a cognitive revolt. I just wanted to hide under the table, mostly from the resumes. And I’m a translator. Who likes to read resumes. So you will want to stand out in this sea of sameness. Translators and interpreters are word people, but the world is a visual place. This is especially true of human decision-making which turns out to be emotion-driven, not logic-driven. That means that you want to make your best impression visually, and persuade verbally, with the objective of imparting confidence, trust and interest in translation buyers. Dress: Clean, crisp and professional. Your first visual impression is important. People judge your dress emotionally and subconsciously, and are often not even aware of how visual impact affects them. This is a subtle but powerful factor. Body language: Much of this is common sense. Smile, don’t scowl; engage, don’t avoid; look at people, not your footwear. Narrative: Gracious, inquisitive and thoughtful are better than the hard sell. Lead with questions about the other person, finish with their wanting to hear more about you. I recognize that this contradicts a lot of what you’ve been told about how to market yourself as a professional translator or interpreter at ATA conferences. But it will make perfect sense if you think about what you, as a consumer, value when you are looking for a plumber, dentist, doctor or any other professional service and are spending your own money on them. That top list is a lot more important and compelling to you as a consumer than the second one is. That’s because the second list is just a description of the provider’s personal history. The first list is all about the customer. Focus on your customer’s requirements, not your own life story (leave the highlights of your life story to your resume). It can make all the difference to a translation buyer who you wish to impress and convince to buy your services. Translators and interpreters are very good at many things at ATA conferences. They always get out of the hotel and visit the host city, make fast friends with hotel staff, comb through all the dictionaries, software tools and vendor products, listen politely, share experiences and stories and are uncommonly generous. The Five Fails listed below are the most common pitfalls encountered at the conference. You will want to avoid these. Friends Only. It never ceases to amaze me how many translators will fly thousands of miles to live for several days in a hotel room in a remote city surrounded by hundreds of potential new colleagues, mentors, advisors and friends only to insist on talking solely and exclusively to…people they already know. The conference is certainly a great opportunity to meet with old friends and renew acquaintances, but its real value lies in pushing boundaries. That means moving outside your comfort zone by striking out on your own and talking to new colleagues. Grousing and Complaining. It’s a rich and supportive environment to let loose about downward pressures on rates, unreasonable client expectations, crazy deadlines, and a total lack of appreciation among the general public and even clients for what translators and interpreters do. After all, where else will you find people who understand your professional life quite so well? We all grumble at times about the vagaries of the profession, of course, but try to resist the temptation of grousing and complaining all the time, especially in the educational sessions or the ATA plenary events. Negativity tends to breed downward spirals of doom and in its purest form is a stunningly powerful client repellant. Deadly Speeches. Making comments or asking questions during sessions should be done in the service of the speaker and the topic. Avoid the temptation to turn your public comments or questions into revival speeches, angry tirades or public challenges of the speaker’s integrity. It’s the nature of controversial topics to sometimes incite such reactions, but if you go down this path, be prepared to alienate the audience. It’s best to seek out a middle ground where civil discussion is possible, even (and especially) if you disagree with the speaker. Staring at Shoes. There’s an old translator joke that goes like this: “Introverted translators stare at their shoes. Extroverted translators stare at everybody else’s shoes.” It may be true that translators are more introverted than other professionals, but take advantage of the more accommodating environment of your colleagues to speak up and share your experience. Arrogance Breeds Contempt. Be careful about throwing your weight around too much. 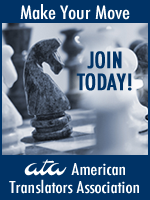 If you want a lesson in humility – and in how spectacularly talented and accomplished your colleagues actually are – the ATA Conference is great place to learn all about it. Good advice, but it requires a good deal of conscious effort for introverts, which so many of us are. Is there any simple way to remind oneself of all this throughout the conference? I am definitely an introvert! I wouldn’t expect you to remember it all and apply all of it at once. However, here is what I would do. Take breaks: go to your room to listen to music once a day, go for a walk, visit the exhibits during a session. Just do something that helps you unwind. Balance is the key. And have a buddy. Maybe the newbies and buddies sessions can help you with that. I make a cheat sheet for myself before going to a conference. This year it might have Kevin’s 5-point list on it (Expertise, Reliability, Accessibility, Flexibility, Value). I also make a list of people I’d like to meet, and I leave my friends off of it (I know I’ll see them). Instead I think about people I’ve made connections with throughout the year on lists but have never met in person, potential clients I’d like to meet (or company staff if the particular person isn’t attending), people whose blog I’ve read or tweets I follow, etc. I am also shy in large groups, so this is a way to keep my eyes up off the floor and scanning a room. I always have a question to ask the person next to me: “Do you know so-and-so? I read her blog and would really like to meet her.” Conversation topic solved.